This pack contains 10 animated knights that you can use in your own 2D game. Each of the 10 knights have a sword version and a sword-less version. 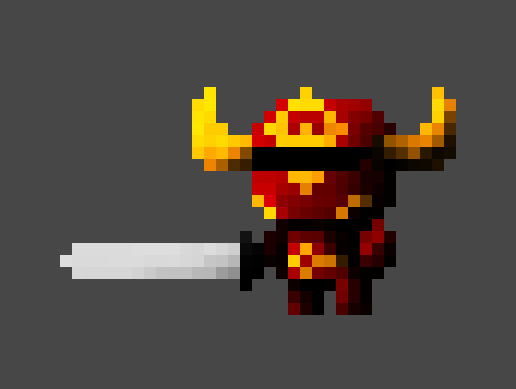 Also included is an easy to use PSD file that you can use to customise the colours and helmet styles of the knights, and save out new sprite sheets. Hi Startled Pixels, is there a chance to get the animations in sperate files? Kind regards! I just purchased them right now but how are we supposed to use them like that? Why aren't they separated each frame in one png? Hi there, the frames for the animations are set up in sprite sheets instead of individual files so that game development programs can easily turn the sprite sheets into animations to use in your game. Thanks for your reply, but the software I am using needs the animation to be separated, but anyway I've done it, and I am using in my game :) thanks a lot.